.... programmable for ANY ink mix! With this new scale you can enjoy the convenience and accuracy of using a PANTONE Formula Scale for mixing any colour ink for which you have a formula - no matter what it is or the ink system and bases used. The PC 'Programmable' PANTONE Formula Scale 3i opens up a whole new world of ink mixing. As you would expect, the PANTONE Formula Scale 3i comes ready programmed with ALL the formulas contained in the standard PANTONE Formula Guide (including metallics & fluorescents), and the latest colours in both the PANTONE Metallic Formula Guide and the PANTONE Pastel Formula Guide. Now all PANTONE Formula Scale 3 Models are also programmed with the NEW PANTONE Goe™System Colour Range. Over and above all these standard PANTONE Formulas, you can store as many as 30,000 different mixes, in up to 64 different ink systems. The memory capacity of this scale is huge! The FREE PC based 'Formula Master' software provided enable you to enter and build up your own databases of colour ink formulations, then to download them to the scale. Also, most forms of existing databases can readily be converted to the required format. Once downloaded, they are stored in the scale memory, and the PANTONE Formula Scale acts as a stand-alone mixing centre. So the connection to the PC is no longer required - you don't have to take the PC into the ink room! In addition, the 'programmable' PANTONE Formula Scale 3i has all the advanced features of the PANTONE Formula Scale 3+ to make ink mixing fast and accurate! 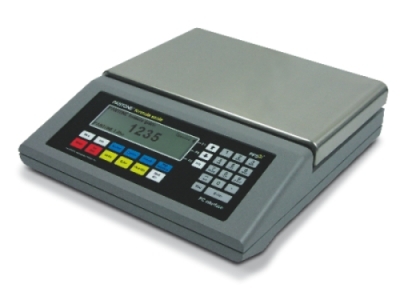 PANTONE Formula Scales are simply the best way to match PANTONE Colours! If you are still not convinced, see our User Survey.